In this paper, the acquisition of new control tools and the improvement of the PWM inverter feeding in the asynchronous motor command are considered. In the asynchronous machine, the directions flow and the electromagnetic torque are closely tied. The scalar command law allows to maintaining the flow and consequently the electromagnetic torque constant for high frequencies. However, this law is very insufficient at low frequencies, what leads us to proceed with the field-oriented asynchronous pulse-width modulation, for high-performance asynchronous machine drives operating at low frequency. The performances of this command are evaluated by using results of simulation realized by the MATLAB software under the SIMULINK environment. The obtained simulation results prove the efficiency of the PWM signal in the command and give excellent electrical magnitude performances of the system. With this easy model, the simulated system, constituted by the asynchronous machine and the two levels voltage inverter, is achieved in a very short time interval and the obtained results are interesting. Сitation: H. Bounoua, A. Bounoua. The utilization of the PWM inverter feeding in the asynchronous motor command. Electronic Journal “Technical Acoustics”, http://www.ejta.org, 2004, 8. 1. Haddad S. Contribution au developpement d’un generateur automatique de programme de simulation de procedes electromecaniques. Thesis, INPL, Loraine, France, 1990. 2. Bodson M., Chiassn J. N., Novotnak R. T. A systematic approach to selecting flux references for torque maximization in induction motors. IEEE Trans. On control system tech., 1995, Vol. 3, N°4, pp. 388–397. 3. Abid M. Modelisation et simulation de l’association onduleur de tension a MLI-machine asynchrone. Master, University of Sidi Bel Abbes, Algeria, 1997. 4. Hautier J. P. Modelisation et commande de la machine asynchrone. Collection Sciences et Technique, 1993. 5. Benbakhti K. Controle vectoriel par orientation du flux rotorique d'une machine asynchrone pilotee par un onduleur de tension MLI. PFE, Electrical Engineering Department, University of Sidi Bel Abbes, Algeria, 1999. 6. Leonhard W. Control of electrical drive. Springer-Verlag, 1985. 7. Bowes S. R. Harmonic minimization in microprocessor controlled current-fed PWM inverter drives. IEEE, 1987. 8. Subrahmanyam V., Surendran K. Performance characterization of a new discrete pulse-modulated current regulator. IEEE, 1984, Vol. 25, N°6, pp. 1139–1148. 9. Belhadef H. Etude et controle de tension de sortie d'un onduleur a PMW. PFE, Electrical Engineering Department, University of Sidi Bel Abbes, Algeria, 1998. Houria Bounoua was born in Algeria. She received the dipl. El.-Engineering degree from the University of Science, and Technology of Oran (USTO, Algeria), the Master degree from University of Djillali Liabes, Sidi Bel Abbes (Algeria), respectively in 1983, 1991. Since 1983, she is a teaching member and involved in research on Numerical command on Power Systems, at the University of Sidi Bel Abbes (Algeria). 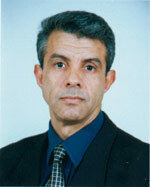 Abdennacer Bounoua was born in Algeria. He received the dipl.El.-Ing. degree from the University of Science, and Technology of Oran (USTO, Algeria); the Master degree; and the Doctorat d'Etat from the University of Sidi Bel Abbes (Algeria), respectively in 1982, 1993 and 2003. Since 1985, he is a teaching member and involved in research on Digital Image Processing and Telecommunications, at the Department of Electronics, University of Sidi Bel Abbes (Algeria).